Remembering those who gave their lives | Walk with us! SCJs join the local community to pray at the site where the first group of missionaries were killed during the Simba rebellion. Fr. Steve is pictured in the hat on the right. Fr. Stephen Huffstetter writes from the Congolese Province where he is taking part in the memorials for SCJ missionaries who lost their lives in the Simba rebellion of 1964. Frs. Charles Brown, Leonard Elder and Claude Bédard (Canada) are also representing North America. 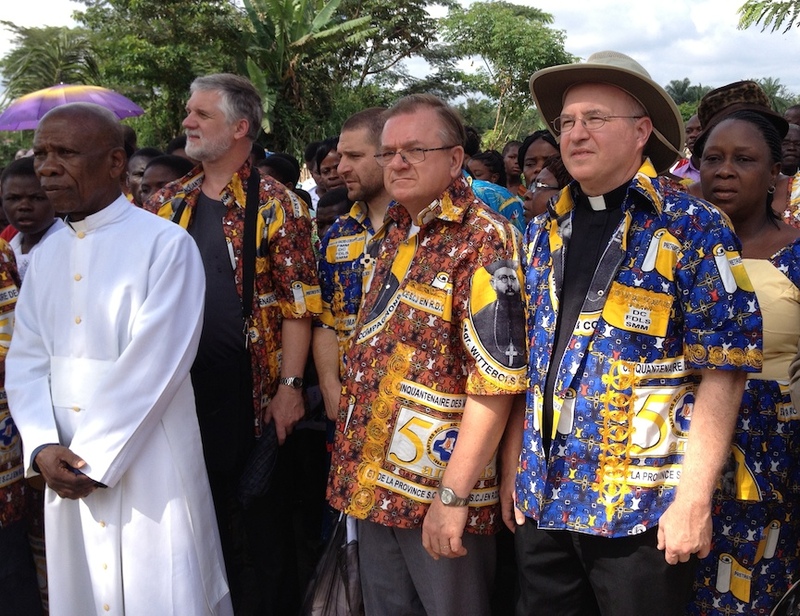 NOVEMBER 22 – We walked to Bishop Marcel Utemi’s house to pay our respects. He warmly received us and thanked the Priests of the Sacred Heart for their rich history in this diocese. Monsignor Grison, SCJ, was the first bishop when this became a diocese. He is remembered with a statue in a small park nearby. Next was a trip to the Procure. The high walled complex covering about a city block reminded me of some medieval fortress. It was here during the 1964 rebellion that many people took refuge. When rebels came Msgr. Fataki, a well loved native Congolese who later became a bishop, was in front of the doors. He stood up to the rebels who wanted to attack the Europeans inside. “If you are going to kill them you will have to shed my blood first.” They backed down and many lives were saved. In addition to the 1964 fighting, the procure and cathedral were shelled as recently as 2000. Bishop Fataki is now buried in the Cathedral, which stands next door, overlooking the wide Congo River. In front of the cathedral stands a statue of the Sacred Heart. At one point revolutionaries were ordered to tear down external signs of the faith. They didn’t know the statue was constructed around steel railroad ties and when their wires snapped trying to topple Jesus, they took it as a sign to cease, and the statue still guards the church entrance. More than an administrative office for religious activity, the procure was a supply center for the entire region. At a time when civil unrest brought all normal commerce to a standstill, SCJs arranged flights from Belgium directly into Kisangani filled with medicine and needed supplies. We saw the well worn printing presses, still in use today, that distribute news and books to the area. Nearby in a small park stands a memorial to those slain in years of unrest. Sadly, it was later used as a killing site and is marked with bullet holes in the tiles. NOVEMBER 23 – Today was the day of our big memorial celebration. It was 50 years ago today the first group of SCJs were killed in a home a few blocks away from St. Martha Church. The Congo River is perhaps a mile wide here, and there are no bridges to cross over. People walked onto a ferry boat that could take several hundred people at a time. As the mass of humanity crowded on board I got a better sense of how overcrowded ferries occasionally have trouble and sink. Yet the chaos quickly dispelled when the religious sisters on board intoned a hymn honoring Mary, and most of the boat started singing along with harmonies that stirred my soul. Fr. 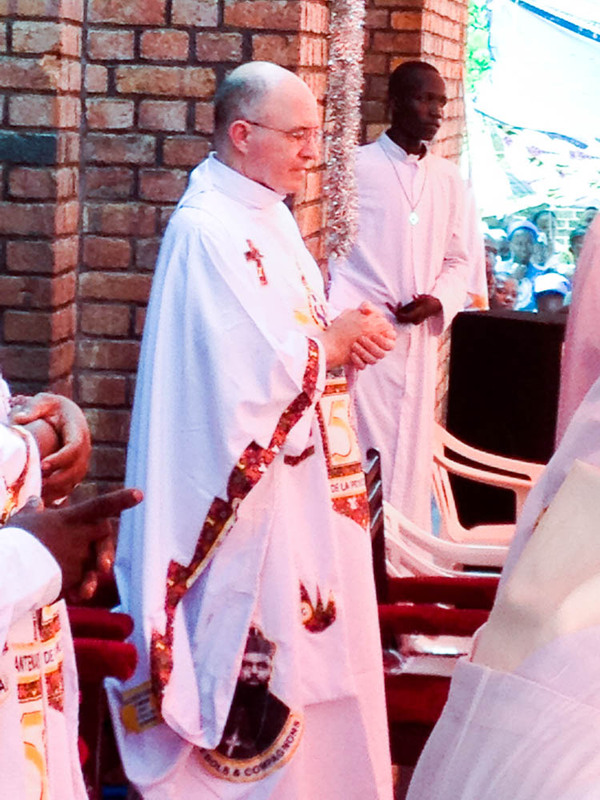 Steve during the memorial service at St. Martha’s in Kisangani; an estimated 3,000 people took part. We gathered at the spot where our martyrs were slain, for prayer and reflection and the laying of wreaths. The mood was disturbed by intense yelling nearby, which I I thought was a domestic fight. I later learned it was a preacher who denounced us Catholics for disturbing the souls of the dead. The crowd for the Mass was huge, perhaps 3,000 faithful from across the city. An altar was set on the front steps of the church, with a tarp providing welcome shade as the temperatures climbed into the 90s. Six tents provided shade for parishioners, yet the people still spilled out onto the roadway and surrounding the church. The opening song and procession into church took a long time as the column of servers, priests and other liturgical minsters shuffled and danced to the rhythm of the drum. While so much of Congolese culture is so totally new and different, the prominence of the drum reminds me so much of my days working with Lakota people. My favorite group of liturgical ministers were a dozen elementary school parishioners. They wore yellow dresses, white stocking feet, long white gloves and a star shaped white headband and they sang and danced to all the songs and liturgical music. I really smiled when they broke out white pom pons too! I’ve never been at a Mass where the collection took a half hour! Initially ushers placed three foot high wicker baskets in the middle of the dirt road leading into church and people streamed from all sides to make their offering. The choir sang two or three uplifting songs during the time. When I thought we were finished, another group of parishioners lined up to present their offerings in kind – live goats and chickens, bushels of beans and vegetables, and bamboo poles heavily laden with bananas and other fruits from the forest. The need for the priest to wash his hands at that part of the Mass makes a lot more sense after handling livestock! Distributing communion to the faithful is always meaningful to me, and today it was even more of a special honor and prayerful experience. I don’t know nor understand the lives of these people and what they’ve been through. Yet they believe, and it strengthens my own faith. After communion came the remarks by the visiting dignitaries. I was warned that I’d be expected to give a few remarks. The Mass was in Swahili, but French is also widely spoken here. I dusted off my high school French from 40 years ago and with the help of Fr. Claude from Montréal told the people and the SCJ community of our prayers and support. All in all we were at the altar almost four hours. While I didn’t understand the language, I paid more attention to the ritual, and the people gathered to pray and remember. We shared a festive meal afterward. The new local food I tried today was a type of fried caterpillar. While it did take me a while to work up the nerve to taste, It reminded me of smoked oyster, only crunchy. The ferry was finished running for the day, so to get back to the other side we loaded into a pirogue. The boat was perhaps 40 feet long and carved out from the trunk of a single tree. About two dozen pilgrims sat on the edges as we motored across the vast river and reflected on an unforgettable day.